HERE is a new yellow neon sign artwork by conceptual artist Nathalie Quagliotto. The artist is interested in text that one would find in amusement sites or in large public areas that is supposed to inform the public of their current location. Quagliotto takes these texts and places them in completely different settings and without accompanying maps to give a new humorously subtle meaning to the words. Quagliotto works specifically with neon because of its brightness and attentive capabilities to cause excitement over a text. Müller and Satzewich have created a kinetic wooden sculpture of La Chasse-Galerie or The Bewitched Canoe by Quebec writer Honoré Beaugrand. The perpetually paddling canoe reminds us of the Quebec folk tale in which a group of debaucherous woodsmen break a pact with the devil and are forced to paddle the night sky above Montreal every New Years Eve for eternity. In the sculptural exploration of the legend, the fragile gears that power the woodsmen examine adialectic between the mechanized forward motion and a Sisyphean cyclicism of all myth and storytelling. 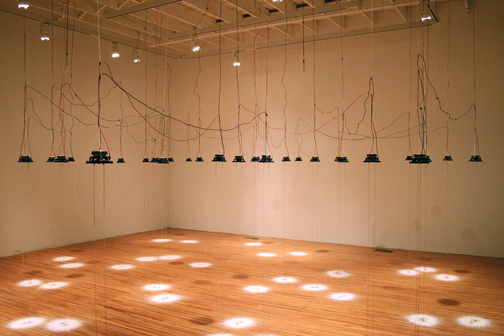 Soniferous eyes is a site-specific installation that explores the interplay between optics and sound. Built from carefully altered found objects and hand-crafted components, the work reinvents familiar technologies by turning them into tools for audio visualization. This investigation applies qualitative methods to generate an audiovisual spectacle, elevating common objects and their sounds to a higher level of vitality. The work will become a temporary audiovisual happening that connects viewers through the mass experience of vibration. In this multi-sensory installation, Cymatic Imprints renders the immateriality of sound as a tangible event by silencing and reinterpreting the data of everyday life. Using a customized Pure Data program, live sound is transposed to infrasonic frequencies which generate visual and sonic variations through the oscillation of fine-ball chains that drop from multiple suspended speakers. As the chains make contact with the floor, their movements carve imprints into piles of sand. The resulting sounds mingle with those of viewers and peripheral ambient noise to create a causal loop of co-responsive activity with limitless variation. Ciel/ceil(ing) explores connections between the artist’s obsession with space exploration and a habit from her childhood, hanging upside-down and imagining an alternate universe in the texture of ceilings. ONLY FLOW explores the complex flow patterns of interconnecting water systems within Calgary. Rachel Duckhouse’s work is inspired by the movement of water within the city: a complex, multi-layered system quietly underpinning urban and rural landscapes. Informed by conversations and site visits with specialists in engineering, fluid mechanics and ecology she constructs her own flow visualizations and reveals a hidden world of imagined pattern and rhythm. Multifarious is an exploration of identity and “self” pairing the works of Lucie Chan and Marigold Santos. Taking influence from childhood games and Filipino folk-tales, Santos examines the notion of the body proper, and the body as an environment/landscape. Chan’s LoFoSto emerged from a series of interviews the artist embarked on with women of different cultural backgrounds; creating a drawing animation in response to these conversations of race and identity.